The man under the moon is one of the owners. 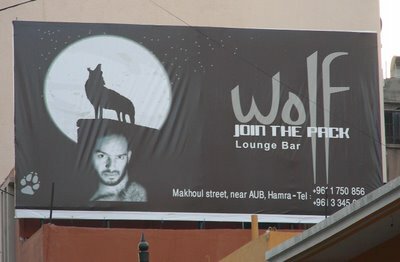 I'm glad to see an advertisement for a gay bar (even if it doesn't say it's gay), alhough I've been hearing more and more bad things about Wolf. First, I know a few people who worked there and quit because the owner was apparently very sketchy. I've heard lots of other bad things, but I can't prove them, so I won't print them. But I don't go to Wolf anymore, that's for sure. A funny thing: if you Google the words "wolf", "gay", and "Beirut", my article pops up before Wolf's site. Ha!